Prospective console modders must now link their creation kit to a Steam account that also owns a copy of Fallout 4. When Bethesda launched Fallout 4 mods on Xbox One, a rather un-anticipated side effect came with it: "mod piracy". Some PC modders were discovering that unscrupulous types were simply porting their work over to the Xbox One version of the game without giving the original creator credit. 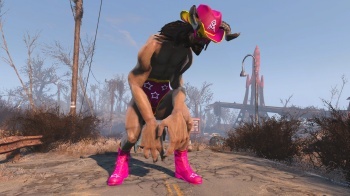 In an effort to curb this behavior, Bethesda has just released an update to its creation kit, which forces console modders to link up to a Steam account that also owns a copy of Fallout 4. "Uploading mods to Bethesda.net requires Fallout 4 ownership via a Steam-linked Bethesda.net account," announced the company in a blog post. What this means for the layman is that Strictly Bethesda now has the ability to ban people from posting mods to Bethesda's official mod service (bethesda.net), requiring them to buy a new copy of Fallout 4 in order to continue posting mods. In theory, this means that Bethesda should be able to stamp out those who simply port PC mods that they didn't create. The creation kit update also prepares it for PS4 mods, which should be coming out over the next month.